General oblique aerial view of Dun Artach lighthouse, looking to the W.
NLO: Torran Rocks [name centred NM 28 13]. For associated signal station and shore establishment at Erraid (Earraid), Mull (NM 297 203), see NM22SE 61. Lighthouse on Dhucartach rock, 15 miles South-West of Iona. 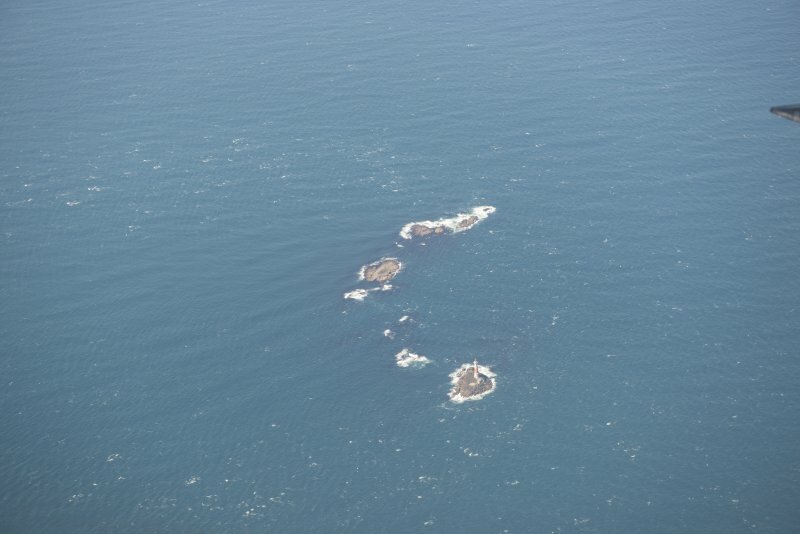 Dubh Artach is one of four Scottish lights situated more than ten nautical miles from shore, the others being Sule Skerry (HX62SW 1), Flannan, and Bell Rock (NO72NE 1). From the Torran reefs, an isolated mass of basaltic rock rising to a height of no more than 35 ft, it guards an extensive area of stormy water between the Rinns of Islay and Skerryvore. The construction works were based around the use of a steel-framed barracks and cost ?65,784; at its inception it was the first isolated rock light to burn paraffin. The light was automated in 1970/1. Dubh Artach (Dubh Heartach) light is situated on a rock at the end of the Torran Rocks reef, 12 miles off the Ross of Mull. It was built by engineers Thomas and David Stevenson with the aid of steam power; work started in April and the light was completed and lit on 1 November 1872. The light was automated in 1971 and the area of the construction barracks is now occupied by a helicopter pad. K Allardyce and E M Hood 1986. From time immemorial the treacherous seas in the area bounded by the islands of Tiree, Iona, Colonsay and Islay claimed many victims. During the winter of 1865–66 no less than 24 vessels were wrecked or driven aground. In order to improve this situation D.&T. Stevenson, engineers to the Northern Lighthouse Board, recommended that a light be established on Dhu Heartach Rock some 14 miles south west of Mull. In 1867–68, under their direction, a shore station for the dressing and fitting of stone was established on the Island of Erraid, Mull, where an abundant supply of excellent granite was available. The construction method was similar to that used at Skerryvore, operating from a temporary barrack, except that, fortunately as it transpired, a wrought-iron instead of a timber framework was used to support the barrack room. The barrack, which was erected in 1868, was soon put to the test when resident engineer Alan Brebner and 13 workmen found themselves unexpectedly occupying it during a five-day storm in August, when ‘heavy broken water frequently rose far above the barrack, and falling on top, which was 77 feet above high water level, completely excluded all light for several seconds’.